Nida has been downgraded to a severe tropical storm as it heads towards the Chinese city of Guangzhou having passed Hong Kong and Shenzhen, causing hundreds of flights to be cancelled, closing schools and halting ferries. Guangzhou, the capital of Hong Kong's neighbouring Guangdong province, issued its first-known red storm alert, with schools and outdoor work suspended. Severe tropical storm Nida, with sustained winds of 105kph, is due to hit the major city later on Tuesday. All emergency rescue and disaster response units, please adopt measures to ensure preparation work for the provision of water, electricity, gas, transport, communications, civil administration, medical treatment, epidemic prevention and food supply and other disaster relief efforts," the city Government said in a statement on its official microblog. Hong Kong raised a T8 storm signal - the third-highest - on Monday evening as the storm edged closer to the semi-autonomous Chinese city, packing winds of 130 kilometres per hour. Cathay Pacific and its subsidiary Dragonair cancelled all of their flights in and out of Hong Kong for 16 hours, from 10:00pm Monday until 2:00pm Tuesday (local time). That will include more than 100 flights, said a spokeswoman for Cathay, the city's flag carrier. Hong Kong authorities shut kindergartens and special needs learning institutions on Monday. Ferries between Hong Kong and the gambling strip of Cotai in Macau have been suspended. Chinese living in the storm's projected path were told to prepare three days' worth of food and other essentials, Xinhua news agency reported, citing the National Commission for Disaster reduction. The cities of Zhuhai and Shanwei in Guangdong province also issued red alerts, while nearby Shenzhen issued a yellow one - the third most severe. More than 220 flights out of Guangzhou, Shenzhen and Zhuhai airports would be cancelled before the storm passed over, the Sohu news portal said. Nearly 2,000 workers constructing the Hong Kong-Zhuhai-Macau Bridge were evacuated on Monday morning, and more than 2,000 others working on an offshore oil platform were relocated on Sunday evening, Xinhua said. Nida brought strong winds and torrential rains to the northern Philippines over the weekend. 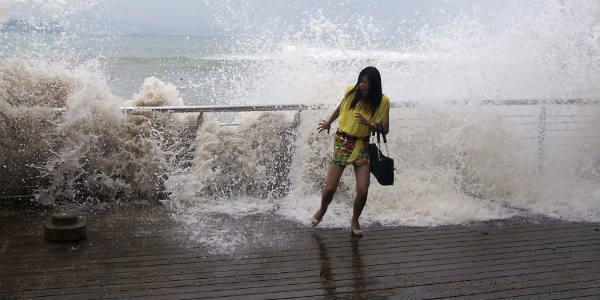 Southern China has been hard-hit by storms this summer.